The following interactive map is a snapshot of some of the inhabitants of the towns of Blairgowrie and Auchterarder in 1911. The map is searchable, and will enable you to locate individuals and households and learn about their living and working relationships. This interactive census map of Blairgowrie and Auchterarder from 1911 allows you to search for individuals amongst our sample drawn from the towns of Blairgowrie and Auchterarder. The map also allows you to examine how people lived and worked in these areas of Perthshire during the early 20th century. In 1911, Blairgowrie, served by the River Ericht, was home to numerous flax-spinning, carpet, jute and linen mills. There were also several saw mills, a farina factory, a brewery, malt kilns and a factory producing agricultural machinery. As well as the Ogilvy Brewery which produced beers and ales, the town also boasted a temperance brewery, making non-alcoholic beverages. Blairgowrie’s growth during the second half of the 19th century was fostered by the extension of the railway system to the town in 1855. In Auchterarder similar manufacturing trades were evident particularly relating to wool processing. Indeed, Auchterader had developed a thriving tartan production industry, and the town was also home to several dyeworks, and flour mills. During the late 19th century attempts were made to find coal beneath the town but these were ultimately unsuccessful. Rural Perthshire, like many similar areas in Scotland, was a net exporter of migrants, although due to the seasonal nature of agricultural work temporary inward migration was not uncommon. The local industries upon which the economies of Blairgowrie and Auchterarder were dependent are reflected in the occupations of working-class residents of the towns. The prevalence of occupations such as ‘Jute Weavers’, Flax ‘Spinners’, ‘Rollers’ and ‘Shifters’, ‘Powerloom Weavers’ and ‘Mill Workers’ offers an insight into the economies of both towns. 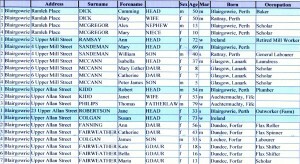 Our analysis of censuses of Scotland over the course of the late 19th and early 20th centuries has demonstrated that regional variations in the formation of families and households were not unusual. This is evident in our analyses of rural Perthshire. While larger urban conurbations such as Govan and Kilmarnock demonstrate that ‘pure’ nuclear family households (male head plus wife and children) accounted for between 40% and 50% of all households, the percentages in Perthshire were significantly lower. While those larger urban populations contained between 15% and 20% single-parent family households, in Perthshire single-parent households represented up to a quarter of all households or as much as one third of all households with children. The examples below from one locality in Blairgowrie in 1911 show the different variations of households living within close proximity to each other. Our interactive map of Blairgowrie and Auchterarder in 1911 is a valuable resource for examining household composition, family forms, and occupations within small rural towns in Scotland.
. . . I was the youngest of the nine children . . . So my mother never really worked because her mother died when she was fifteen and she was just, eh, well, a housekeeper, with her father [after that] . 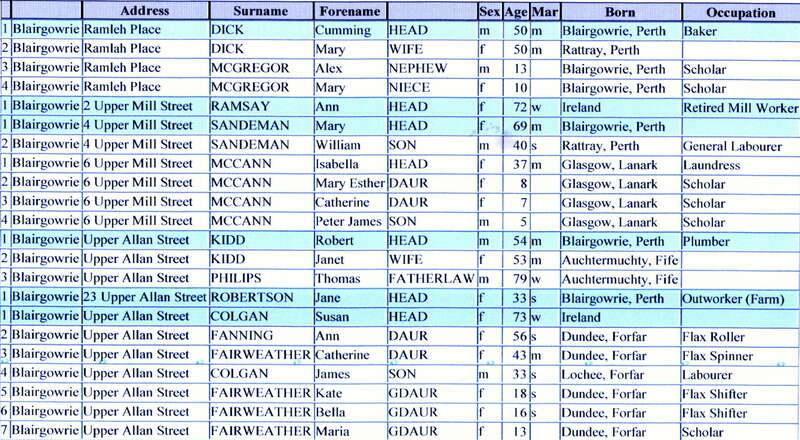 . . [So] seven of my brothers and sisters were all born at [named] Street, Blairgowrie. Now I think there was probably only about a maximum of two bedrooms . . . And seemingly granddad had his own room – So, yes, that’s what I was told: he had his own room so it must have been a crush. And I know my oldest brother, for one, actually had to sleep up in the attic space, because, while he studied – They were a highly intelligent family, so, em, my oldest two brothers went to [named] University. . . But they believed in educating boys, but not girls so much . . .
. . . I was there [working on the buses] in ’46, my husband-to-be, he started in ’46, he was, eh, demobbed, from the army. So he started in ’46. And, em, we got married in ’49 . . . I met him on the buses. I was a conductress and he got demobbed, eh, New Year’s Day, ’46, from the army and he eventually came on to the buses as a driver. And that’s when we met! [Laughs] . . . Even when I was a teenager, I remember my sister would be up – My oldest sister, she was in the army and, em, she came home on leave, and she was going to this dance. I didnae get to the dancing, you see, Father didn’t think that they were just the done thing, Saturday night dances for me, you see. So, em, my sister said it, eh, Would it be alright if [she] comes to the dance with me? And he says, As long as you have her home by twelve o’clock [laughs]! Just as the interactive census map provides a wealth of historical detail for rural Perthshire – which includes local household composition, family form and occupation – in a highly accessible format, our oral history accounts also constitute rich source material with which to further develop the historical understanding of marriage and family in Scotland. As has been illustrated, one important way in which they do so is by illuminating the lived experience of variation in local and regional family forms, working and social lives.